Missouri truck accidents are responsible for many vehicle-related accidents and injuries. Commercial trucks, also known as big rigs, semi trucks, 18-wheelers or tractor-trailers, are much larger than passenger vehicles or pick-up trucks and are more difficult to maneuver, making them dangerous in the case of a Missouri accident. That, combined with the grueling schedule many commercial truck drivers face, means semi trucks can be deadly on the roads. Victims involved in a Missouri truck crash may face medical bills, loss of future wages, rehabilitation costs and loss of current wages. Send your Missouri Truck Accident claim to a lawyer who will review your claim at NO COST or obligation. Commercial truck drivers who drive vehicles that weigh 10,000 lbs or more face different regulations than passenger vehicle drivers. Trucks that are driven for interstate commerce face federal laws. Additionally, Missouri has its own intrastate trucking laws that govern truck maintenance, securing loads and truck routes. 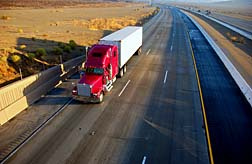 Under the laws, truck drivers must periodically face drug testing, keep updated log books and drive no more than 11 hours after 10 hours of consecutive off-duty hours. Trucks that carry hazardous materials must also follow special regulations. Negligence in truck accidents takes a variety of forms. These include failure to stop at a light or stop sign, failure to yield to another vehicle, failure to yield to a pedestrian and driving while distracted (including talking on a cellphone). In the case of commercial trucks, negligence can also include driving over the legal hours, not getting enough rest time, driving while tired and having a vehicle that is overweight. 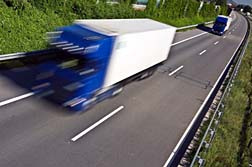 In cases of injury or death caused by negligent driving, the injured party or his family may be able to sue the driver of the commercial vehicle, the owners and/or operators of the vehicle and the people responsible for the truck's maintenance. Missouri uses the principle of pure comparative negligence when determining truck accident liability. This means that in the case of a semi truck accident, the injured party can recover damages for his injury even if he was 99 percent at fault for the accident. In this situation, however, the victim's awarded damages are reduced by the amount of fault he is responsible for. For example, if the injured party is 25 percent responsible for the accident, his award will be reduced by 25 percent. Defective automobile parts can play a role in serious truck accidents and can result in harm to a vehicle's occupants or other people on the road. Issues with commercial vehicles include faulty brakes, engine problems and steering problems. In the case of injuries caused by truck defects, the injured party may be able to sue the maker of the defective part, the automobile manufacturer and the companies or individuals responsible for repair and maintenance of the vehicle. In Missouri, it is illegal for commercial drivers to drive with a blood alcohol concentration (BAC) of.04 or higher. In Missouri, Driving Under the Influence (DUI) is the same as Driving While Intoxicated (DWI). The DWI includes alcohol and/or drugs. It is illegal for drivers in Missouri to operate a vehicle with any amount of a controlled substance (such as marijuana or cocaine) in the blood. Other causes of semi truck accidents include improper driver training, dangerous or reckless driving, poor driving conditions, failure to leave adequate room between vehicles and driving aggressively. Alleged Stolen Vehicle Causes Missouri Truck ..